Legendary actor and entrepreneur Robert De Niro has launched a new vodka in partnership with an Australian artisan spirits merchant. Vdka 6100 was co-created by the Goodfellas and Taxi Driver star with Australian spirits company, the Artisan Spirits Merchants (ASM). 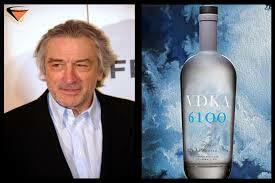 Although the vodka had already been created by ASM, De Niro was approached to front the brand in 2012 and contribute to the brands packaging and marketing. Speaking to the Wall Street Journal, the actor, who is also a hotel and restaurant investor, said: “I was approached by some people who wanted to do a whole product campaign, which was a very tasteful, terrific idea.